BY SYDNEY ROSS SINGER – Get ready for a year of brainwashing as Hawaii’s media promotes a new government agenda. We are all supposed to learn to hate ducks, so the feds can kill them. That’s right, it’s duck season in Hawaii, and the US Fish and Wildlife Service wants to shoot as many wild ducks as it can find. But they won’t shoot just any duck. They hope to make sure it’s a mallard, not the endangered Hawaiian duck, aka the koloa. They look the same, with the koloa resembling the female mallard, so they will try to be careful. In fact, the koloa so resembles the mallard that mallards and koloa can’t even tell themselves apart, which seems to be part of the problem. About the only way to tell them apart is that the koloa has a softer quack than the mallard. So the feds will listen carefully before they blast them to smithereens. Scientists are not certain whether it is the female koloa who attracts the attentions of the male mallard, or if the male mallard, with his flashier colorful appearance than the drab male koloa, is just considered hotter by the female koloa. Whatever the chemistry, the two species find one another irresistible and create fully viable offspring. This is why some bird experts treat the Hawaiian duck as a subspecies of the mallard. Most likely, some mallards made it to these islands a long, long time ago and decided to stay. But evolution wasn’t fast enough to make the Hawaiian duck so different from the mallard that they can’t interbreed. Over the years the Hawaiian duck population declined for a variety of reasons, including habitat loss, modifications to wetland habitats for flood control, diseases, environmental contaminants, and predation by cats, rats, and mongooses. 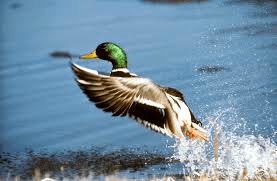 But it is difficult to control these factors, so the new emphasis is being placed on another factor that can be controlled, namely, interbreeding with mallards. The solution, according to the USFWS, which seems to have a passion for killing wildlife, is to shoot wild mallards throughout Hawaii. The shooters will likely be hired guns from the USDA Wildlife Service. Last year, in 2013, they killed around 4 million animals, including 75,326 coyotes, 866 bobcats, 528 river otters, 3,700 foxes, 12,186 prairie dogs, 973 red-tailed hawks, 419 black bears and at least 3 eagles, golden and bald. They take to killing wildlife like a duck to water. But will killing our wild ducks help save the koloa, of which there are only about 3,000 left? And, more importantly, why does it matter? Why are we destroying our successful wildlife to save our unsuccessful wildlife? Will the world be worse off if the Hawaiian duck became assimilated into the mallard population? The USFWS and DLNR are also targeting Hawaii’s cattle egrets and barn owls for slaughter. Like the mallard, these birds have the common flaw of having been introduced to Hawaii. These days, introduced birds run afoul of the law, which protects only native and endemic species while trying to eradicate everything else. The assumption is that if the government kills everything that was introduced, then the old Hawaiian species will again flourish. However, there is no turning the clock back. Climate change, pollution, predation, disease, habitat loss, and other problems will continue to stress native wildlife to the point of extinction. If we continue to kill our introduced wildlife we will have no more wildlife. Then the environmental managers will again realize that these islands in the middle of the ocean need life introduced to them, and there is nothing wrong or evil if people are the agents of that introduction. Until we return to that realization, wildlife will have to duck. we need more mallard ducks and less politicians and bureaucrats. There is no indigenous life here. Everything was imported. What constitutes "Hawaiian" Flora and Fauna is very subjective and time dependent. Who's on First, What's on second? I say we eliminate most politicians, bureaucrats, environmental nut cases, lawyers and judges. We all would be better off. Mallards and cattle egrets. What's next? How about mynas, doves, meijiro, bulbu, sparrows, finches, and parakeets? They're all "invasive" species. OK, how about the wallabies in Kalihi Valley? Before you know it, Hawaii will be like Guam. Dead quiet, no bird calls. I've been to Guam…real eerie. No bird noises. Everybody, just listen for the bird noises. Won't it be strange without them. While the FWS is at it, how about the rats and pigs? Typical Federal agency. Creating work for themselves. Now, how about truly protecting the monk seals from harassment from beachgoes.